This classic French dish from the Lorraine region of northeast France consists of a tart shell filled with a mixture of eggs, milk, cream, bacon and (sometimes) grated cheese. For best results, I recommend making the pastry yourself. Quiche is traditionally made using pâte brisée, a tender savory crust, and the recipe is below. However, if you are pressed for time, you can use an uncooked store-bought pie shell. Regarding the other ingredients, the bacon should be thick enough to be chopped into lardons — cubed bacon sticks about 1-1/2 inch (4 cm) long and 1/4 inch (6 mm) per side. Lacking this, get the thickest bacon you can find and chop into smallish pieces. In a previous era, quiche lorraine was traditionally prepared without cheese, but these days it is commonly included. The best varieties are Comté, Gruyère, Emmenthal or a similar hard cheese. You can also omit the cheese if you prefer. Serve the quiche as a lunch dish with a salad alongside, as a first course at suppertime or cut into small squares at cocktail hour. 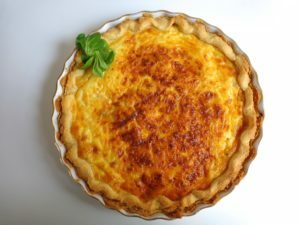 Quiche lorraine is traditionally served with a chilled white wine from eastern France, for example Saint-Véran, Macon blanc or a dry Alsatian white. But a fruity red would also marry well. If you have one, use a 10-inch (26-cm) tart pan with vertical sides. If not, use any pan, round or rectangular, that can hold about one quart (one liter) in volume. Begin by making the shell. Make sure the ingredients are at room temperature when you get started. In a large bowl, cut the butter into small pieces. Using two knives, cut in the egg yolk, then the flour and salt. This is easily done. Simply hold the knives parallel to each other and cut in opposite directions. When the butter is well coated with flour, go in with your hands for the final blending. Mix until the dough is no longer sticky and holds together in a ball. You may need to add a bit more flour. Form a smooth ball and let the dough rest for a minute or two. Then pat the dough into your tart pan, taking care to ensure there are no cracks. Place in the fridge to cool for at least 10 minutes. Alternatively, you can chill the dough briefly and then roll it out. In either case, do not prick the dough. The shell can chill for as long as you like. When ready to complete the recipe, preheat the oven to gas mark 6 (350 F, 180 C). Cut the bacon into lardons as described above. Heat a little oil in a frying pan and sauté the bacon over high heat, stirring frequently, until it is cooked but — important — not yet starting to brown. This takes about 4-5 minutes. Drain and set aside. Grate the cheese using the large side of your grater. If you don’t have a scale, 1/4 pound (100 grams) of grated cheese makes about 2 cups (1/2 liter), loosely packed. Set aside. Crack the eggs into a large bowl and whisk until well blended. Add the milk and cream and whisk again. Add the salt, pepper and nutmeg and whisk a final time. To assemble the quiche, remove the shell from the fridge. Scatter the bacon evenly over the bottom. Scatter the cheese over the bacon. Pour the egg mixture on top. Gently place the quiche in the oven and bake about 40 minutes, until the top is golden brown and a knife inserted into the middle comes out clean. If you test the quiche and the knife doesn’t come out clean, continue baking another 5 minutes. This quiche is best served piping hot, so either serve it straight out of the oven or reheat it before bringing it to the table. It will serve four people as a main course at lunchtime, six as a starter at suppertime or about ten people if cut into little squares at cocktail hour.